Genomic stability is maintained by telomeres, the end terminal DNA protein structures that protect chromosomes from fusion or degradation. Telomeres are essential for the proper maintenance of chromosomes and may play a role in aging, cancer and several other diseases. Shortening or loss of telomeric DNA repeats or altered telomere chromatin structure is correlated with telomere dysfunction such as chromosome end-to-end associations/telomere fusions that could lead to gene amplification and genomic instability. The DNA structure at the end of telomeres is distinguished from DNA double strand breaks (DSBs) in order to avoid nonhomologous end-joining (NHEJ), which requires unique, higher order nucleoprotein structure. Telomeres are attached to the nuclear matrix and have a specific chromatin structure. Whether this special structure is maintained by specific chromatin changes is yet to be thoroughly investigated. Altered telomere chromatin structure has been linked to defective DNA damage response (DDR), and eukaryotic cells utilize the DDR mechanisms of proficient DNA repair and cell cycle checkpoints in order to maintain genomic stability. 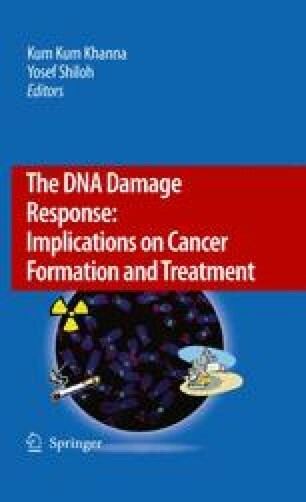 Studies of the DNA damage response has lead to the identification of sensors and transducers which constitute a hierarchical signaling paradigm for the transduction of the initial damage signal to numerous downstream effectors, some of which have a role in both genomic stability and telomere metabolism. This review will summarize the factors involved in telomere maintenance and the influence of such factors on the DNA damage response. The work in my laboratory is supported by National Institute of Health grants CA129537 and CA123232 (T.K.P). We thank the members of my laboratory Q. Yang and S. Scott for their help and thoughtful discussion.